2-step outlet tap prevents the risk of urine drips. *Excluding the Conveen Security+ bedside drainage bag, hospital model. Moveen® Night Drainage Bag is Conveen® Basic bedside drainage bag. 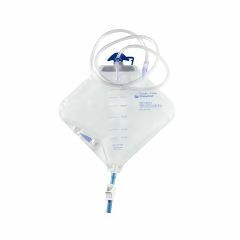 Secure and reliable urinary collection bag with anti-kink tubing to prevent accidental leakage. Large capacity enables the user to feel secure all night. Free of PVC and phthalates.